Becoming a homeowner is a dream for many. However, the dream of homeownership quickly turns into a nightmare for those who aren’t prepared for the unexpected costs that come with owning a home. Switching from renting to owning a home comes with many changes. As a renter you were able to call your landlord any time something went wrong. As a homeowner you are responsible for the maintenance and repairs of your home – this can be very expensive. As a homeowner there are many times when an emergency fund will come into play. Here are some of the surprises that come along with being a homeowner. As a homeowner you should save for routine maintenance issues like servicing your furnace, sealing blacktop driveways, or getting your septic tank pumped. Then there are unexpected maintenance issues that pop up. A prime example is waterproofing your basement. If your house has a basement then waterproofing it is extremely important. Many new homeowners find out that they have flooding issues in their basements only after purchasing their house. To prevent the flooding the drain systems outside have to be fixed and waterproofing inside the basement needs to be performed by a professional to prevent mold and mildew. Making repairs to your home has crossed your mind but you don’t understand just how much of a financial impact these repairs can have until one has occurred. In some circumstances your homeowners insurance will cover repairs, such as wind blowing the roof off your house but you’ll still have to pay the deductible portion of the bill. However, if your roof is deteriorating you’ll have to cover the cost yourself. A new roof for a small house can easily cost in excess of five thousand dollars. Other common repairs include plumbing and electrical. In the winter your pipes could freeze and bust causing major plumbing issues that could call for an emergency plumber. Your hot water heater could go out, also requiring plumbers like Express Rooter to repair it for you. You never know what can go wrong when you own your own home. Your refrigerator could stop working. Your lawnmower could break down. Your furnace could die. Your hot water heater could go bad. You just never know what will happen when you own a home. 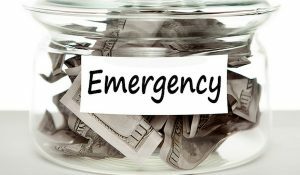 It’s important to have savings for routine maintenance that will help prevent costly repairs and also enough money to cover those unexpected expenses. At the very least you need enough money to cover your homeowner’s insurance deductible. Although it’s wise to have a much larger buffer for all of the repairs that may arise. Even though owning a home is a dream for many it can quickly turn into a nightmare if you aren’t prepared financially. When it comes to owning a home it’s better to be safe than sorry. What are your thoughts on making sure you have enough savings before buying a house?